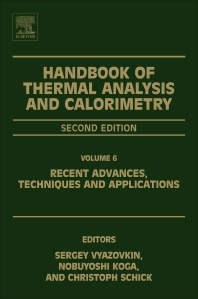 Handbook of Thermal Analysis and Calorimetry: Recent Advances, Techniques and Applications, Volume Six, Second Edition, presents the latest in a series that has been well received by the thermal analysis and calorimetry community. This volume covers recent advances in techniques and applications that complement the earlier volumes. There has been tremendous progress in the field in recent years, and this book puts together the most high-impact topics selected for their popularity by new editors Sergey Vyazovkin, Nobuyoshi Koga and Christoph Schick—all editors of Thermochimica Acta. Among the important new techniques covered are biomass conversion; sustainable polymers; polymer nanocompsoties; nonmetallic glasses; phase change materials; propellants and explosives; applications to pharmaceuticals; processes in ceramics, metals, and alloys; ionic liquids; fast-scanning calorimetry, and more. Sergey Vyazovkin received his PhD from Belorussian State University (1989). His research is concerned with the kinetics of thermally stimulated processes in condensed phase systems. He is a winner of the Mettler-Toledo Award in thermal analysis and of the James J. Christensen Award in calorimetry. Professor Vyazovkin is editor of Thermochimica Acta, a member of the editorial board of Macromolecular Rapid Communications and Macromolecular Chemistry and Physics, and the chairman of the Kinetics Committee of the International Confederation for Thermal Analysis and Calorimetry. His research has been published in one book, four book chapters, and 160 peer-reviewed papers cited over 11,000 times. Nobuyoshi Koga received his PhD-CSc from the Institute of Chemical Technology in Pardubice (Czechoslovakia, 1991). His research covers thermal analysis and mechanisms of solid-state reactions. He is also known as a specialist in chemistry education research. He is a winner of the ICTAC Young Scientist Award (1996), Jaroslav Heyrovsky Honorary Medal for Merit in Chemical Sciences (The Academy of Sciences of the Czech Republic, 2013), The Award of the Japan Society of Thermal Analysis and Calorimetry (2014), and others. Professor Koga is editor of Thermochimica Acta (Elsevier), honorary editor of the Journal of Thermal Analysis and Calorimetry (Springer), editor of a Japanese book on thermal analysis, and vice president of the International Confederation for Thermal Analysis and Calorimetry. His research on thermal analysis has been published in 12 book chapters and 100 peer-reviewed papers as well as two book chapters and 50 peer-reviewed papers on chemistry education. Christoph Schick received his PhD from Technical University Merseburg, Germany (1980). His research is concerned with glass and phase transitions in different materials spanning from small organic molecules over polymers to metals. He is interested in advanced calorimetric methods, particularly fast scanning calorimetry. He is a winner of the Mettler-Toledo Award in thermal analysis, the James J. Christensen Award in calorimetry, and three more European awards in calorimetry. Professor Schick is editor of Thermochimica Acta, a board member of the German society of thermal analysis (GEFTA), and counsellor of the International Association of Chemical Thermodynamics (IACT). His research has been published in one book, 15 book chapters, and 300 peer-reviewed papers cited over 7,000 times.